The historic 105-mile Skyline Drive, a National Scenic Byway, traverses Shenandoah National Park, a beautiful, historic national treasure. 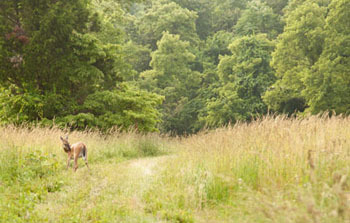 The Park varies in width from less than one mile to about thirteen miles, so that views from peaks and overlooks include not only the Blue Ridge itself, but also the patchwork of woods, farmlands and orchards on either side. The drive begins in the north at U.S. Route 340 near Front Royal, and ends in the south at an interchange with US 250 near Interstate 64 (I-64) in Rockfish Gap. It is a two-lane road that has 75 overlooks providing views of the Shenandoah Valley and the Virginia Piedmont. 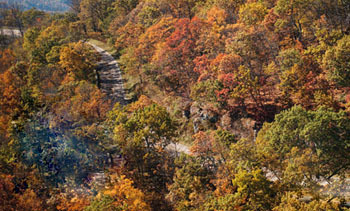 Skyline Drive is designated a National Scenic Byway and a National Historic Landmark and is listed on the National Register of Historic Places. Wildlife includes the white-tailed deer, black bear, raccoons, opossum, skunk, birds, red and gray fox, beaver, river otter, mink, weasel, woodchuck, rabbit, squirrel and chipmunks. With as many as 200 species of local and migratory birds, viewing opportunities at Shenandoah are good to excellent. Campsites are available. More modern accommodations are available at Skyland Resort and Big Meadows Lodge with full service restaurants and planned activities.